We’re back with our not so Wordless Wednesday blog post. Words with Dogs: Adelle and Linus use body language to help define the word: Confusion. 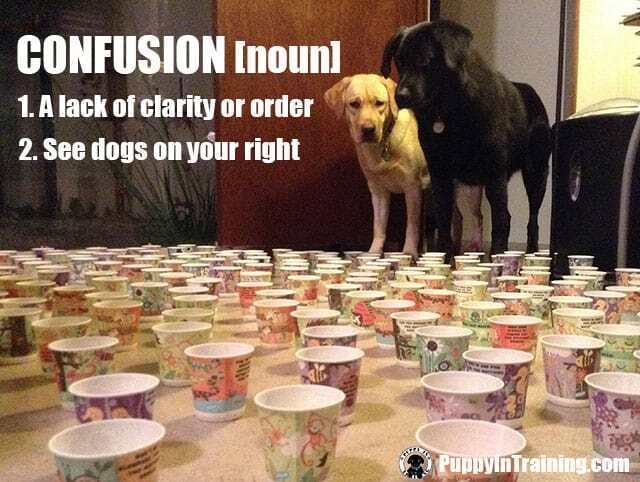 This picture defining the word confusion brought to you by our pals Adelle and Linus. Do you have the same confused look on your face right now? Tell us what you think this picture is all about in the comment section below. We’ll let you know what’s going on with this pic in the coming days. Yes we are a little confused… but I’m thinking they are doing some sort of scent work…. That’s a great guess! I had a few others say the same thing. Stetson does K9 Nosework and on Easter one of our games was for him to find the easter egg with the odor birch. The room looked a lot like this one except with plastic easter eggs instead of paper dixie cups. There must not be any food in those cups as they are so well behaved. Of course, they are very good at listening. I’m curious. What’s in the cups? They weren’t really listening to me just thoroughly confused. Ali put all the cups in my office so I couldn’t get to my desk as an April Fools prank. I guess the true prank is to fill each cup with water which would have been much less fun for me. Adelle and Linus didn’t want to disrupt any of the cups, but when Stetson came into the room he just walked right through them.